CONARC process for steelmaking was developed by Mannesmann Demag Huettentechnik (now it is SMS Siemag). The objective for the development of this process was to utilize the benefits of both the conventional top blown converter steelmaking and electric arc furnace (EAF). The name of the process CONARC sums up the fusion of the two processes (CONverter ARCing). The technology of this process is based on the increased use of hot metal in the electric arc furnace and is aimed at optimizing energy recovery and maximizing productivity in such an operation. The process was developed for using any kind and mix of raw materials like hot metal, direct reduced iron (DRI) and scrap to ensure highest quality requirements for the production of all grades and qualities of steels covering a wide range from carbon steels to stainless steels. Depending upon the requirements of the finished products, CONARC process is followed by a ladle furnace or a vacuum degassing unit. The basic equipment of CONARC process consists of two identical refractory lined furnace shells, one slewable electrode structure with one set of electrodes serving both the furnace shells, one electric supply (transformer etc.) for both the shells, and one slewable water cooled top oxygen lance system serving both the shells. Alternatively two stationary top lances, one for each furnace shell for the blowing of oxygen can also be used. Option is available for introducing bottom stirring devices integrated to the bottom of each of the furnace shell. Options are also available to introduce burners and injectors systems in the shell for the injection of fuel, carbon and oxygen as per the process requirements. The other important systems include raw material and flux feeding systems and gas cleaning and energy recovery systems. 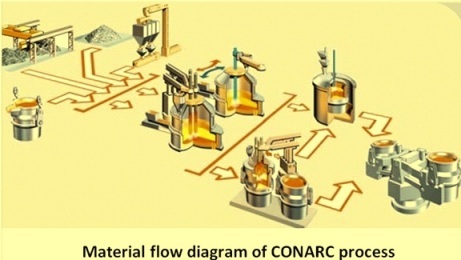 Typical process flow of CONARC process is at Fig 1. The basic concept of CONARC process is to carry out decarburization in one shell and electric melting in another vessel. The CONARC process for the production of carbon steels is split into two stages. The first stage consists of the converter process during which the decarburization of liquid iron is done by blowing oxygen in the liquid iron through the top lance. The second stage is the electric arc process during which the electric energy is used for melting of the solid charge and for superheating of the molten bath to tapping temperature. The typical process starts with the charging of the liquid iron into a ‘liquid heel’ consisting of a small part of the previous melt which was kept in the furnace after tapping of the previous heat. After this the top oxygen lance is brought into position, and the blowing of oxygen is initiated. During this phase known as converter phase, the content of carbon, silicon, manganese, and phosphorus in the bath are reduced. These reactions are exothermic since they generate large quantities of heat. Cold material like scrap or DRI is added to the furnace to utilize this energy and to avoid overheating of the bath. Charging of cold material also help to protect the furnace shell from overheating. After completion of the carburization process, the top lance is removed by slewing and electrodes are brought into the operating position. With this the second phase known as arcing phase starts. During this arcing phase, the remaining solid charge material like scrap or DRI is charged into the bath so as to achieve the desired tapping weight of the heat. The temperature of the bath is then increased to the required value. After temperature is achieved, the arcing is concluded and the heat is deslagged before the heat is tapped into the teeming ladle. In CONARC process, out of two furnace shells, one shell operates in the converter mode using the top lance while the second shell at that time operates in the arc furnace mode. The principle of the CONARC process is at Fig 2. A two stage boiler system is used for the waste heat recovery. In the first stage, the waste gas from the CONARC process is led through a boiler system consisting of a swivel type elbow, a post combustion chamber and a hot gas line and cooled to 600 deg C. These components are designed as pressure parts for steam generation. In the second stage, the waste gas is cooled down to 200 deg C in a vertical pass boiler especially developed for this type of application. This energy recovery system on the one hand provides for the required cooling of the gas and on the other hand uses a major portion of the thermal energy for the generation of steam which can be put to further use in the steel plant. The process has the following advantages. High flexibility with respect to material input, scrap, liquid iron and DRI which can be used in various mixing ratios according to the requirements of the steel quality and/or availability and/or unit prices of these materials. CONARC concept permits this process to cover the full range from pure EAF operation with 100 % scrap/100 % DRI to pure converter operation. 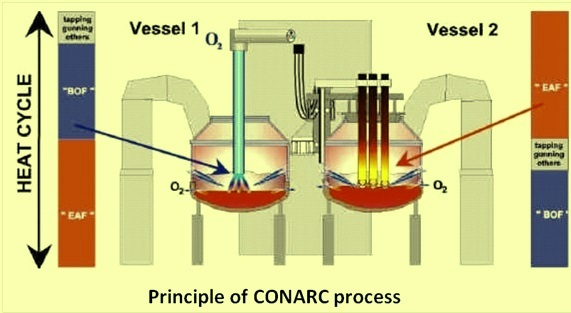 The CONARC furnace is not a sheer electric melting unit but also act as a chemical reactor. Hence it controls the concentration of tramp elements in the steel due to the increased amount of the use of virgin materials. CONARC process is flexible and can handle liquid iron with changing contents of silicon, phosphorus and sulphur without any problems. CONARC process also has advantages when treating hot metal with higher phosphorus content (up to 0.2 %). Several aspects such as simple temperature control by adding DRI as coolant, addition of lime, as well as the withdrawal of phosphorus oxide rich slag by constant slag overflow via the slag door help to achieve an efficient phosphorus removal. Tap to tap times of less than 40 minutes are easily achievable. Large flexibility regarding energy resources. Efficient energy recovery system reduces CO2 emission levels. Effective energy recovery system of the process has a significant and sustainable contribution towards the energy efficiency of the steel plant.